The Central Coast Chorale presents their end of season concert. As always, our spring concert series is an eclectic mix of classical, contemporary, folk and fun. We’ll be singing some lovely pieces by Eric Whitacre and Ralph Vaughn Williams. There will be some up tempo songs by Harry Belafonte and an African folk song. We’re even going to be a bit silly with a piece from P.D.Q. Bach. We’ll be welcoming our special guests the Women of Note who have a couple of poems set to music for us. It should be a lovely evening (if you’re in Yachats) or afternoon (if you join us in Lincoln City or Newport). Admission is a suggested donation of $10 per person or $20 for a family. We look forward to seeing you! The Central Coast Chorale presents its annual program of holiday music at the Newport Performing Arts Center with a big plus. The centerpiece of the Newport concert with be a one afternoon only performance of Craig Courtney’s A Musicological Journey Through the Twelve Days of Christmas with orchestral accompaniment. This humorous bit of Christmas fun will take us on a journey through the ages accompanied by horns, timpani and even a harp! In addition, some familiar carols and some lovely holiday sentiments will make this concert a wonderful way to kick off the holiday season and get you in the Christmas mood. As usual Women of Note will be our special guests. A donation of $10 is suggested for admission. Hope to see you in Newport! The Central Coast Chorale presents its annual program of holiday music at the Lincoln City Cultural Center. Some familiar carols, some lovely holiday sentiments and at least one bit of musical humor will make this afternoon a wonderful way to kick off the holiday season and get you in the Christmas mood. Special guests Women of Note will join us as usual. A donation of $10 is suggested for admission. Hope to see you in North County! $25 & $39 plus ticket fees; students $10. NSO will be joined by Central Coast Chorale, Corvallis Repertory Singers, and Willamette Master Chorus – 150 voices in the combined choir - along with soloists Erica Brookhyser, Janice Johnson, Les Green, and Anton Belov for this special performance. Also included in this concert is Baal Shem by Ernest Bloch, performed by concertmaster Casey Bozell. Join us for an evening of choral arrangements of music in movies—from Girl Crazy to Mamma Mia to Wayne’s World to James Bond and more—by Freddie Mercury, ABBA, Adele, and more! The Central Coast Chorale presents a mix of music drawn from Requiem masses by various composers. From the 1600s to the present day, we've chosen works by Mozart, Allegri, Barber, even Andrew Lloyd Webber. There's some gorgeous music here. Don't miss it! We suggest a $10 donation for admission. PLEASE NOTE THE 2 PM START TIME FOR THE NEWPORT CONCERT. The Central Coast Chorale presents a mix of music drawn from Requiem masses by various composers. From the 1600s to the present day, we've chosen works by Mozart, Allegri, Barber, even Andrew Lloyd Webber. There's some gorgeous music here. Don't miss it! We suggest a $10 donation for admission. The Chorale will present our annual holiday concert at the Newport Performing Arts Center The chorale will be singing the glorious Vivaldi "Gloria" along with a selection of shorter seasonal pieces including Sweelinck's "Hodie Christus Natus Est" and Rutter's "Blow, Blow Thou Winter Wind." Those of you who enjoyed our "dancers" at the spring concert will be glad to see their appearance as part of "Kuimba" a South African song of celebration. We will welcome guest musicians to provide a small orchestra as our accompanists, the first time we've done this in several years. We're really looking forward to strings and oboe. And, as always, our small, women-only group, Women of Note, will step out from the chorus to perform several pieces. Those will include a Manhattan Transfer style version of "Snowfall" by Ruth and Claude Thornhill, the lovely, melodic "Something Told the Wild Geese" by Sherri Porterfield and a fun and intricate madrigal "Throw Open the Shutters." Join us for a concert that celebrates all the wonderful moods of the holiday season from glorious to joyful to just plain fun. There is a suggested donation of $10 for admittance. The Chorale will present our annual holiday concert at the Yachats Commons The chorale will be singing the glorious Vivaldi "Gloria" along with a selection of shorter seasonal pieces including Sweelinck's "Hodie Christus Natus Est" and Rutter's "Blow, Blow Thou Winter Wind." Those of you who enjoyed our "dancers" at the spring concert will be glad to see their appearance as part of "Kuimba" a South African song of celebration. We will welcome guest musicians to provide a small orchestra as our accompanists, the first time we've done this in several years. We're really looking forward to strings and oboe. And, as always, our small, women-only group, Women of Note, will step out from the chorus to perform several pieces. Those will include a Manhattan Transfer style version of "Snowfall" by Ruth and Claude Thornhill, the lovely, melodic "Something Told the Wild Geese" by Sherri Porterfield and a fun and intricate madrigal "Throw Open the Shutters." The Central Coast Chorale will be joining the Newport Symphony Orchestra and the Willamette Master Chorus to present selections from Handel's Messiah at the Performing Arts Center in Newport. Mark your calendar now to join us for this quintessential holiday treat! The Central Coast Chorale will be presenting a spring concert with an Earth Day theme. We're excited to be performing Eric Whitacre's Cloudburst, John Rutter's For the Beauty of the Earth, Robert DeCormier's arrangement of Harry Belafonte's Turn the World Around, Earth Song by Frank Ticheli along with several other pieces that celebrate the beauty and power of our world. Women of Note will add an international accent with a suite by Finnish composer Aullis Sallinene and Three Spanish Ballads by Eugene Butler. Please join us! A $10 donation is suggested for admission. 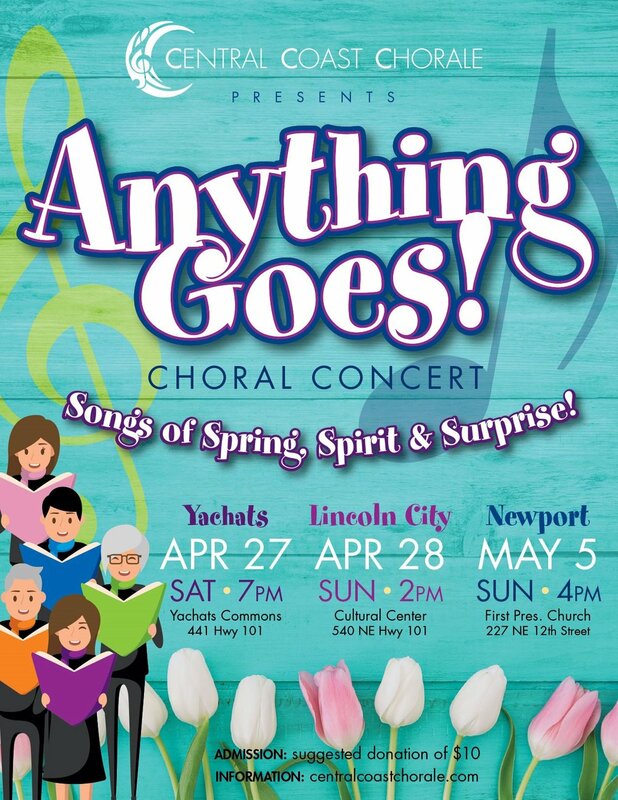 The Central Coast Chorale will be presenting a spring concert with an Earth Day theme. We're excited to be performing Eric Whitacre's Cloudburst, John Rutter's For the Beauty of the Earth, Robert DeCormier's arrangement of Harry Belafonte's Turn the World Around, Earth Song by Frank Ticheli along with several other pieces that celebrate the beauty and power of our world. Women of Note will add an international accent with a suite by Finnish composer Aullis Sallinene and Three Spanish Ballads by Eugene Butler.. Please join us! The Central Coast Chorale joins the Newport Symphony and the Corvallis Repertory Singers for a special Christmas concert under the baton of conductor Steve Zielke. The evening will include Morten Lauridsen's gorgeous Lux Aeterna, selections from Bach's Christmas Oratorio, Mendelssohn's Verlieh Uns Frieden and plenty of other familiar Christmas favorites. Tickets are $34 for preferred seating, $20 for general admission and $10 for students with ID. Tickets may be purchased at the Oregon Coast Council for the Arts website or at the door.